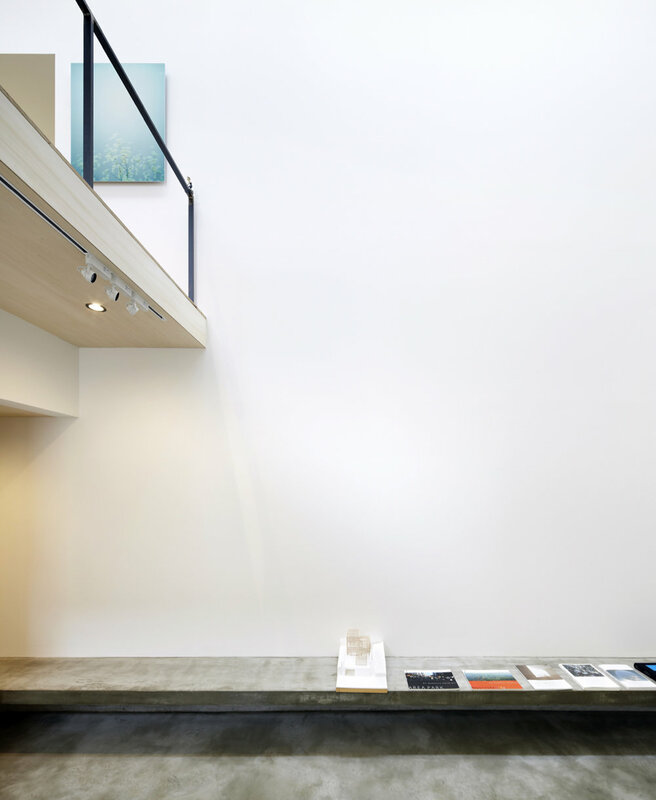 It was the summer of 2013 when our friends — a married couple who are a photographer and a lacquer artist — asked us to design their home and studio, which will also be their new operating base at Tokyo. Other than their own bedroom and living space, they specifically requested to have a separate guest room, a photography gallery, an atelier and a rooftop terrace with a good view of the surroundings. Towards the north of the site, there is a small artificial hill that was constructed during the Edo period called Nakazato-Fuji, and for a home that sits beside this cultural heritage that was built based on religious faith and appreciation towards natural landscapes - we simply wanted it to embody a primitive shape as if it was something that grew naturally from the land or something that is unearthed from archeological sites. The finishing materials of the interior were chosen in terms of how the residence came about. Specifically, the exterior of three cuboids that represents walls and roof are built with gypsum boards that are painted white, which is obviously different from the wood that is used for the partition walls and floor (plywood for the walls and ceiling and an oak timber flooring). By choosing the finishing materials on the principles of how the architecture was formed instead of focusing on the purpose and size of the rooms, we thought that it would be possible to explicitly show the ge­ographical characteristics (like the distance from the ground or the difference in space that is determined by the direction of the window) that each place in the house have. Inside, there are a limited number of doors. By joining the rooms with stairs that come in various sizes in a spiral form, the indoor space is not only connected horizontally but also vertically. Based on this structure, the gallery -the most important space in the house- is not isolated from the living room, dining room or bedroom, and it was our intention as designers to achieve a design where the architecture can naturally play its role in the daily lives of the two artists.